For future integrated structural health monitoring (SHM) systems the complexity of the used algorithms is limited due to the restricted computational capacities of the onboard CPU. 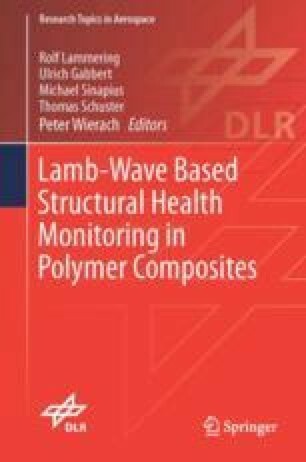 Therefore, an efficient method to approximate the wave propagation in complex fiber reinforced polymer structures is proposed. Model properties are reduced to phase velocities in individual areas and interaction characteristics at their connecting spots. A ray tracing algorithm enables a fast identification of possible wave paths from an actuator to a sensor. With this information, signals at the sensor position can be calculated analytically. The accuracy of this method is checked on an aluminum plate with and without a cutout. The present chapter is concluded with a discussion of advantages and limitations of the proposed method and an outlook to its use for anisotropic materials.